The ultimate buoyancy aid for your next touring adventure, river calm or choppy sea, the High Back 60N provides the most advanced solutions in comfort technology design. Its raised back profile buoyancy placement means that no matter what type of boat you are in, you can be assured of its comfort properties. In addition the High Back 60N provides breathable air mesh air flow technology helping you stay cool on even the warmest of days and a sculpted foam design helping to ensure the buoyancy aid moulds to the shape of your body to help ensure you are as fresh and comfortable when you arrive as when you set out. This buoyancy aid isn't a life saver. To survive, you need to be able to swim. This buoyancy aid is just a swimming support. Level 50 PFD - ISO 12402-5 Swimmers only, sheltered waters, help at hand, limited protection against drowning, not a life jacket. All YAK buoyancy aids are specifically designed for paddling. Whatever the adventure there is a YAK to fit. Continuous product research and development ensures that all yak products remain innovative, inspired, and function above and beyond our own hiqh standards. 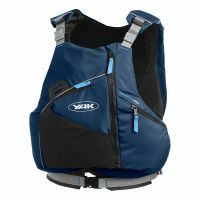 The YAK team have worked tirelessly to make radical innovative changes to this range of buoyancy aids. We would like to have your feedback for future development. Have fun on the water but remember... please paddle responsivly! This product is a buoyancy aid not a life jacket. A life jacket will give a reasonable assurance of safety from drowning to a person who, for whatever reason, is no longer capable of helping themselves fully. A buoyancy aid will provide support to a conscious person who is able to swim and to help themself in situations where help is close at hand. Swimmer only, sheltered waters, help at hand. Limited protection against drowning. Full performance may not be achieved using waterproof ciothing or in other circumstances. Certain circumstances will alter this performance, such as waves, or the wearing of garments which provide additional buoyancy. The buoyancy provided by the jacket can be affected if heavy objects are carried in the pockets. Your buoyancy aid is made from materials which have been tested for strength and durability. lt is fitted with closed cell (non absorbent) foam and conforms to the minimum requirements for buoyancy and standard of manufacture as required by ISO 12402-5. The buoyancy aid will only function correctly with all the foam pads inserted. This range of buoyancy aids are not suitable for use with a safety harness. Train yourself in the use of this device. This range of buoyancy aids differs slightly in donning method. See separate quick start guide. For infomation about your quick release belt, see separate quick release belt guide. Always check that you have donned your buoyancy aid properly and that all fastenings are secure. Practice and training are required before use. In an emergency there is no time to learn how the equipment works. You should practice putting it on and making the final adjustments for a safe fit. Practice swimming in the water to get used to the flotation position it gives you. Always adjust the belts to a close fit, this will reduce the possibility of the buoyancy aid riding up. lt is recommended that the buoyancy aid is worn outside other garments to enable adjustments to be made. Children should be encouraged to learn how to put their buoyancy aids on for themselves. Teach the child to float in this device. Treated properly this buoyancy aid should give you several years of hard use. Do rinse it out in fresh water and leave to dry fully before storing it in a dry place. Do check the buoyancy aid regularly for damage. lf it shows signs of damage it should not be used. Please refer to YakAdventureEquipment.com for returns and repair policy. Do not store it in a damp place orout in the sun, near petrol or any other chemicals. Oil or similar marks should be removed by washing with warm soapy water. Never clean your buoyancy aid in a washing machine or dry in a tumble dryer. Do not useas a cushion asthis maydamagethe foam inserts. All closed cell foams will slowly lose a proportion of their buoyancy as the foam ages. This means that after a number of years, especially if it has be carelessly used or stored, the buoyancy aid may no longer provide the approved amount of buoyancy provided at time of manufacture. Following 3 years of use the buoyancy aid it should be tested annually. lf the buoyancy falls below the minimum buoyancy it must be replaced. Always wear a Buoyancy Aid. A buoyancy aid should be worn for every canoeing activity, regardless of how well you can swim. Should you capsize it will keep you afloat and,unlike a life jacket,you can easily swim to help yourself. A buoyancy aid is probably the most important piece of safety kit you'll invest in so don't just rush out and buy the first one you see. Treat it with respect and it will last a long time. Life jackets are designed to keep you floating the right way up but are generally too bulky to swim in, let alone paddle, so a buoyancy aid is the natural choice for the canoeist. Canoeing buoyancy aids are foam-filled not air-filled. What must a Buoyancy Aid do? Be comfortable to wear, so that your body is free to move but tight enough so that it does not come up over your head when you are in the water. Be suitable for the particular paddle sport you would like to do. Buoyancy aids should be brightly coloured, so that you can easily be seen. lts main role is to save your life should you capsize, not as a pillow when you stop for lunch. Buoyancy aids that pull on over the head and those with front openings are equally suitable. The aid should fit you snugly and have a belt or draw cord to secure it at the waist. Before buying a buoyancy aid, check that you can sit and move comfortably in your canoe or kayak while wearing it. Make a point of practising swimming in your buoyancy aid. Look after your buoyancy aid, keep it clean, do not crush it and store it in a cool place. A buoyancy aid also provides excellent insulation against the cold. And last, but not least, does it have a pocket for the all-important chocolate bar (and anything else you need with you)? Canoeing is a risk activity but accidents can be avoided by a combination of training, based on the accepted code of technique and safety, and experience gathered over a number of years, where techniques are acquired and practised under the shadow of a leader. Lack of Knowledge - in correct usage of equipment, or lacking knowledge from which a balanced judgement can be made. Over-estimation of Ability - inevitable with young,inexperienced canoeists. Carelessness - may affect both novice and expert. Ensure you have sound knowledge of the skills, techniques and equipment you are using by undertaking adequate training. Be able to swim at least 50m. You do not need to be able to swim vast distances but the ability to remain confident in and under the water, without panicking, is vital. Use a buoyancy aid. This should be worn whenever you get into your boat. Stay with the boat. ln the unfortunate event that you do capsize stay with the upturned canoe. A canoe is easier to spot than a swimmers head and its in-built buoyancy will help youto remain afloat. Never paddle alone. lf anything does go wrong it is vital to have someone else along. lt's also friendlier. Make sure you are properly equipped for the water and weather conditions you will expect to encounter. Attend a qualified first aid course and get qualified. Of course there are other things to be taken into consideration but common sense and reading the relevant sections of the 'Canoe and Kayak Handbook' published by the British Canoe Union will give you much more help with maintaining personal safety whilst canoeing.